Crested Pool churns at a slow boil while the clouds in the sky at sunset are reflected in the water surrounding it. The depth of Crested Pool is 42 feet and water in it maintains a constant boil, but may shift between just simmering or a violent boil, when the water may as high as 8 to 10 feet. 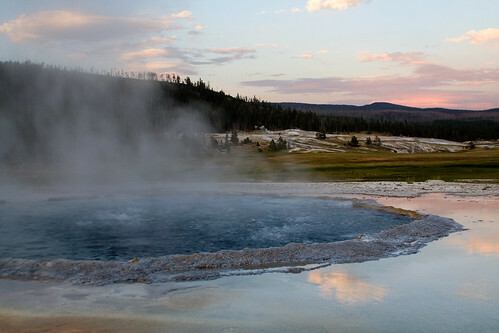 This entry was posted on May 15, 2008 at 7:28 pm and filed under boiling water, Crested Pool, National Park, pool, steam, sunset, thermal, Upper Geyser Basin, vacation, water, Wyoming, Yellowstone, Yellowstone National Park.